The movie was released in 1995 (with a special directors cut around 2002). It was a unique film where a ring is found in the 1930's in Egypt. Years later, Daniel Jackson (James Spader) is approached by an older woman who has a proposition for him. He quickly decodes a set of tablets and is shown the 'Stargate'. With military personal lead by Jack O'Neill (Kurt Russell), Daniel travels through the Stargate to another galaxy. On the new planet they quickly discover a race of people living there and try and communicate with them. Daniel learns their language with ease and manages to find the co-ordinates to get them home, all bar one. Though back at the Stargate a large pyramid like ship had decended on the gate location and taken the military personel left to guard the gate hostage. Soon the team in the city learn that Ra, the Sun god of Egypt and the sand dwelling people, has returned. They race back to the gate only to get themselves captured. Ra learns of Jack's explosive device and modifies it so that it will destroy Earth. It is an interesting movie, full of action and adventure but really nothing overly much to brag about. I liked it yes, the concept was very neat and Ra was an awesome bad guy but in some places it is a little dry. The director's cut is more informative with loads of new scenes and some clarifications that were well needed. 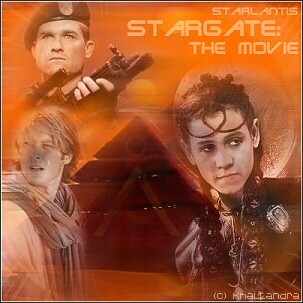 Though it was this movie that spawned SG1 and subsequently Atlantis so itt gets a huge thumbs up for that. It is interesting to see the different acting styles used to play the characters by the movie actors and the tv show actors, but the characters still remain the same. I recommend it to all.